At our July board meeting, the Mountain Top Historical Society board members recognized Sidonia Palace for her service to the group. They noted with great appreciation that Sidonia was among the founders of the MTHS. It was a brief article in the Windham Journal in 1972 when Sidonia was the editor, that brought together a few people interested in preserving local history. By 1974, that group had a charter as the Mountain Top Historical Society. 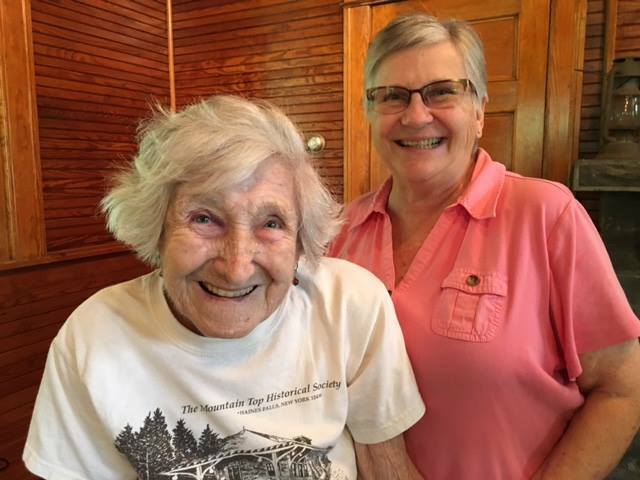 For 42 years, Sidonia has been a vital part of that organization as a member, board member, editor of the Hemlock newsletter, volunteer at the Visitors' Center, and MTHS representative at lectures and other events. Sidonia's term as board member has ended and she decided not to run for another term, but she will still be seen around the campus as a valued volunteer. Greet her with a smile and a thank you when you see her there! Our thanks to the team of National Honor Society students and their advisors from Hunter Tannersville Central School who volunteered to help the society get ready to open the campus for the season. A great bunch of people. We wish them continued success at HT, and to those who are about to graduate, our best wishes as they begin a new phase in their lives and education. In the late 1700s, the land that was to become the Town of Hunter was part of a vast land grant, the Hardenburgh Patent. The wildness and poor suitability of the area for agriculture delayed settlement of the area until the early 1800s. According to Beers' History of Greene County (1884) the only settlers in the Hunter area at that time were Tory refugees from Putnam County and some people who fled New England in the wake of Daniel Shay's rebellion. The two major resources that brought people into Hunter in the first half of the 19th century were the abundant hemlock trees and the physical beauty of the area. Cyndi and Dede sign Around Hunter for Fran Driscoll. The Greene County historian in 1927, Jessie V.V. Vedder wrote: “ The scenic wealth of the Catskills lies within the borders of the Town of Hunter. 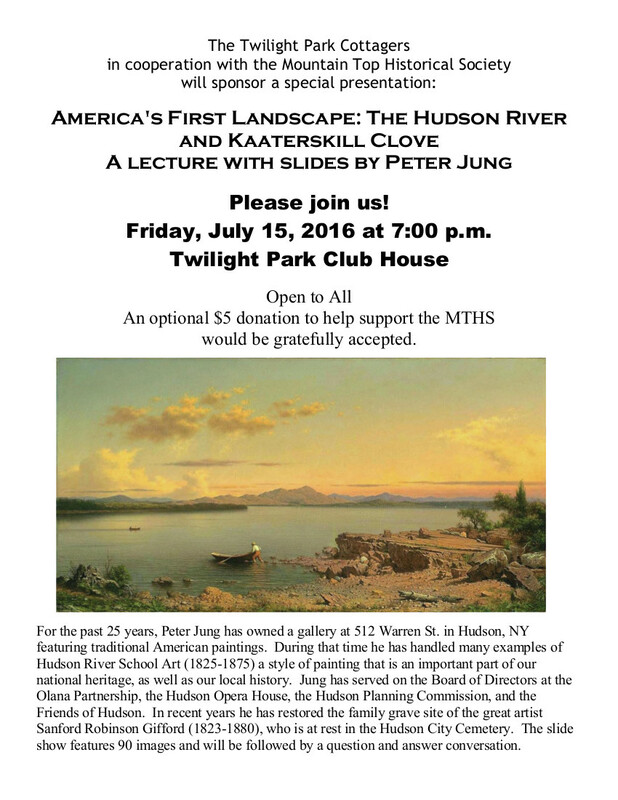 It has been more richly endowed in this respect than any other town in Greene County.” Three cloves with their streams, ravines and cliffs are located in Hunter, along with impressive vistas of the Hudson Valley. Town of Hunter historian, Dede Thorpe, and president to the Mountain Top Historical Society, Cyndi LaPierre, used vintage images from the MTHS archives and other sources to share the 200 year story of the area Around Hunter, highlighting the resourcefulness of local people earning a living in a wild and beautiful part of New York State. Around Hunter was released on September 28, 2015 and had a premiere at the Mountain Top Historical Society on October 4, 2015 with a presentation by the authors and book signing. A second event with presentation and signing is scheduled for the Catskill Mountain Foundation Bookstore on November 14, 2015, from 1:00 p.m. until 3:00 p.m. Come in to meet the authors and pick up your signed copy of the latest local history book. You can purchase your copy of Around Hunter by stopping in at the MTHS Visitors' Center in Haines Falls on Monday, Wednesday or Friday from 1:00 p.m. until 4:00 p.m.. You can also send a check to the MTHS, PO Box 263, Haines Falls, NY 12436 and they can send you a copy. The cost per book, including tax, is $23.75. Please add $3.00 for shipping and handling.